Home dyslexia John Hicks parenting 3 Ways On How To Cope As A Parent Of A Dyslexic Child. 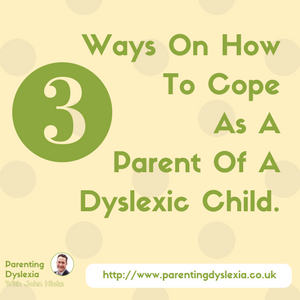 3 Ways On How To Cope As A Parent Of A Dyslexic Child. This article is for parents who have recently had their child diagnosed with the condition of dyslexia and who previously have had little experience with the condition and now need answers. My hope is that this article will give you opportunity to find what you need as you support your child. Dyslexia is a funny thing! I am 45 now, and I don't think that I have ever been unaware of the terms 'dyslexia' or 'being dyslexic'. I always thought that if someone was dyslexic then they would be someone who could not read and write. I think that this is a common stereotype. I think that I would go so far as to say that many people have the same thoughts about dyslexia if they have not had any previous experience of the condition. Unfortunately, this is a really unhealthy and inaccurate stereotype. It doesn't take into account the many characteristic signs of the condition and often leads to children with dyslexia being labelled with negative terms such as lazy, stupid etc etc. In the past five years of my personal dyslexia learning curve I have come to realise just how complex having dyslexia is and just how misunderstood it is. But this seems crazy! The British Dyslexia Association states that around 10% of the UK population has dyslexia. In a country of about 65 million people that is a staggering 6.5 million people who are living with the condition. In a school class of 30 kids, that will mean that about three kids will have some kind of learning difficulty. The '10%' figure is an estimate based on people currently diagnosed. In a recent GL Assessment study called 'The Lost Girls Report', it was claimed that there are thousands of girls in the UK who are clever enough to hide the condition at school and so miss getting diagnosis and support. So it would appear that despite the high incidence rate of dyslexia in the UK, there is a relatively low awareness level for the condition. So it is no surprise that when a child gets diagnosed, where to go for information as a parent about what dyslexia means and what steps to take next, is a little unclear. From an emotional perspective, this can be hard for parents too. 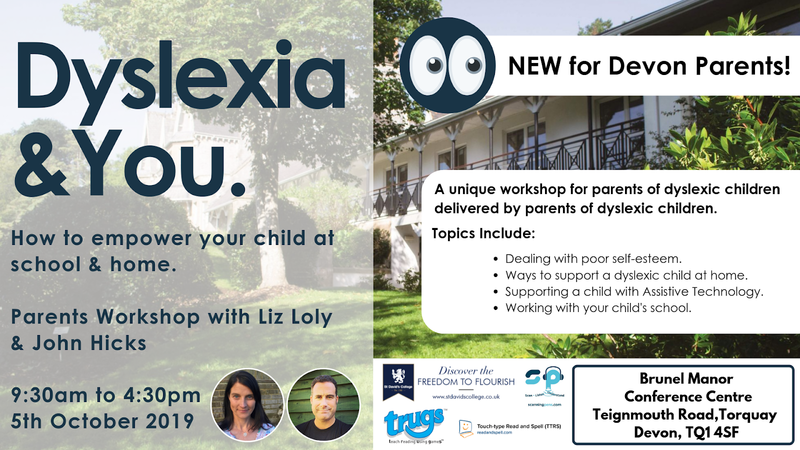 If they have that dyslexia stereotype in their heads when they first hear of the diagnosis then there can be quite a strong emotional reaction if they think that their child will be unable to read and write. In many cases, dyslexia affects the ability to read and write, it doesn't affect intelligence and often there are so many easy to implement strategies that can help a young person with their literacy capabilities. Having dyslexia is NOT an 'educational death sentence'! With support, my daughter did so well in her secondary education whereas before support she struggled. We found that once we understood her version of dyslexia, we could then find the right support strategies to help her realise her potential. 1) Educate yourself on what Dyslexia actually means. You have a report now that says that your son or daughter has dyslexia. It is likely that in that report you will see lots of statistics about how your child performed in the tests leading to the diagnosis. The specialist giving you the diagnosis may or may not give you advice as to what the diagnosis means in practise. The first thing to do is to check your reaction to the diagnosis. What is your mind telling you that having dyslexia must mean? Is it similar to the stereotype that I mentioned above? If your answer is 'Yes' then you don't have anywhere near enough information for you to be able to make sense of what the diagnosis means. I don't mean for this to sound patronising but when my daughter was diagnosed I didn't know a lot about dyslexia. At the time, it seemed like a huge piece of bad news, then I found out more and I realised that with some of the challenges of having dyslexia, there are some amazing plus sides too. The more you find out the more you will be able to more fully support your child. A) The British Dyslexia Association website - Loads of information and opportunities to go to meetings that will help you to find out more. B) The Studying With Dyslexia Blog - Information and inspiration for supporters of dyslexic learners. C) SprintPlus website resource page - This is a page that I manage and I have listed a bunch of resources that could be useful in helping to increase your knowledge about dyslexia. D) Join my Parenting Dyslexia Facebook Group - I have set this up to provide a forum for parents of dyslexic kids to come together and share information and resources. We are currently just over 100 members. 2) Maintain a healthy dialogue with your school regarding the support of your child. 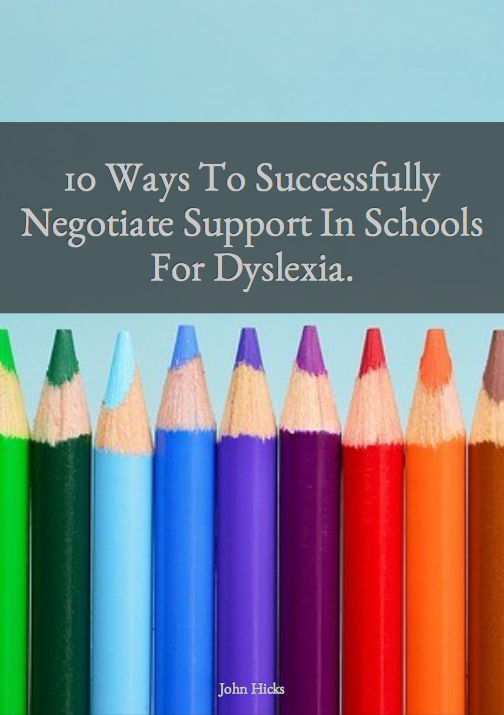 Depending upon how proactive your school is with regards to supporting dyslexic students you are about to embark on a conversation with your school which will at times be frustrating for them and for you! Your school is required by law to provide reasonable adjustments in supporting your child, but from what I have experienced and seen over the years is that the problem comes when the school and parents have different opinions on what those reasonable adjustments should be. If the diagnosis report details what they should be then you have every right to request that your child receives what has been recommended. This may mean that you have a fight on your hands in getting that implemented. My advice to you is to keep a cool head, note everything and keep pushing. Persistence is key and if you get nowhere, escalate your displeasure to the headmaster or board of governors of the school. More information about your school's obligation can be found here on the UK Gov website. 3)Take time to listen to what your child is telling you about their experience of dyslexia. As a parent, when there is something going wrong for our children we often want to fix that situation. We can be known to dive in with a solution to a problem before we even know that our child wants our help. If we really want to help our children with their experience of dyslexia, we really need to listen first to what is happening for them and accept what they are telling you regardless of whether it sounds positive or not. Sometimes kids just want to be listened to and know that they have been heard without parents rushing to rescue them. I know that I have made this mistake a thousand times and I truly hope that you will see that in taking time to actively listen to what your child is thinking and feeling, you will see that your child's confidence will improve because they know that you have their back when they need it. This sounds so obvious doesn't it? But so often we as parents think that we know better and that is not always the case. I am writing an online dyslexia aware parenting course that will cover some of this information. Would you like to try a part of it out for free? If the answer is yes, simple complete the form below and I will let you know when the free chapter is available for you to use. You will also get an invitation to join our Parenting Dyslexia Facebook Group.